We can all agree that tradition is one of the best parts of the holiday season. Sharing a tradition builds family bonds and provides the comfort of familiarity, but after a while the years can start to blur together until no one can remember what year Uncle Johnny lit the neighbor's yard on fire deep frying a turkey, or when Grandma’s pecan pie won first prize in the county fair. And while carrying out the traditions themselves can be more cherished than the secret family recipe they are built around, every once in awhile, change can be a welcome breath of fresh air. At RootsRated, we believe in the invigorating power of that fresh air, which is why we are proposing something a little different for this holiday season. Below is a guide to creating a holiday feast al fresco with a few recipes to cook over a campfire. So be bold and savor the new experience. The food will taste better as the cool crisp air heightens your senses. And who knows, you might just be creating a new tradition. Specific ingredients for each dish are listed below. 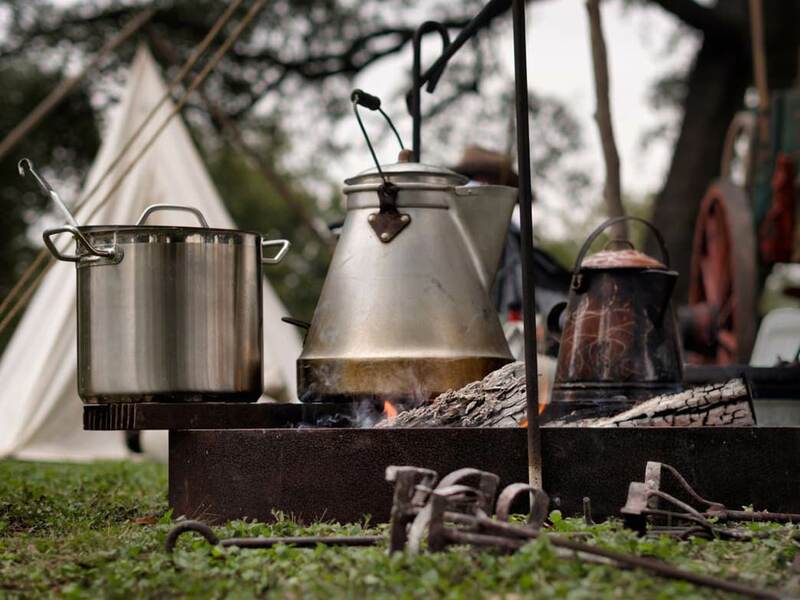 Of course a campfire is going to be the most important element in your rustic repast, so be sure to know the basics of building a good cooking fire. A level, U-shaped fire ring with one prominent “chimney” stone at the back is ideal, but any flat fire ring will eventually produce the desired bed of smoldering coals. This smoldering bed of coals is going to be crucial to ensure even cooking of your food. 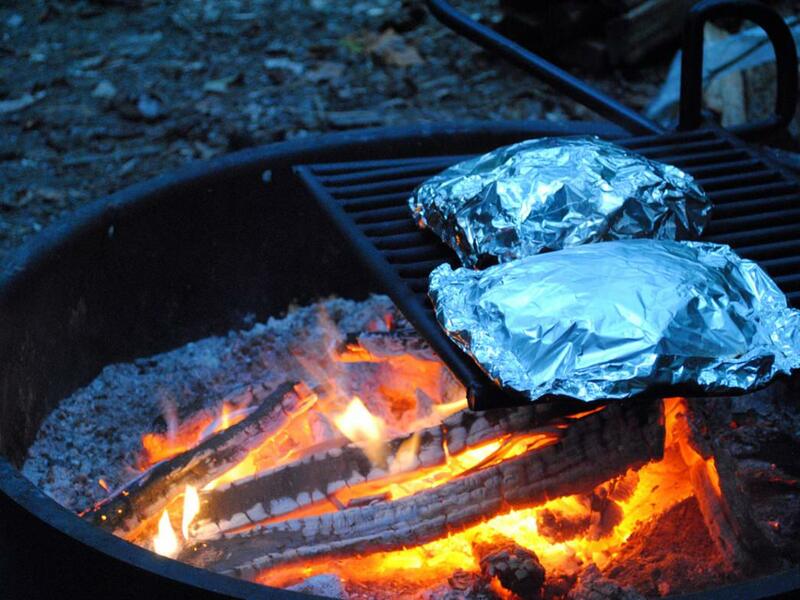 Bringing along a fire grate is optional but encouraged if you intend to use camp cookware. However, several of the recipes below call for no more from the kitchen then a simple roll of aluminum foil, which is great if you plan on packing light. These recipes embody the simplistic yet delicious flavors that can be achieved by cooking over an open fire with nothing more than aluminum foil and your favorite seasonal produce or cured meats. Quick pro tip: once you have your fire blazing and are waiting for it to turn to coal, place your fresh garlic on a nearby stone to roast while you prepare the rest of your ingredients. Be sure the garlic does not catch fire, but is close enough to roast in the husk. This will make an amazingly smoky, savory addition to your meal. Now you’re ready to begin. Start by chopping an assortment of the fall veggies listed above. It is important to chop them fairly small so that you’re not waiting all night for them to cook. Tear a 12-inch sheet of aluminum foil (one per person) and mold around your fist in the shape of a “pocket”. Depending on how full you’re filling your pocket, you may want to double up the foil. Drizzle some olive oil into the bottom of the pocket to prevent sticking and fill with veggies. Sprinkle with salt and pepper, add a sprig of thyme, sage, or rosemary and stuff in a couple cloves of roasted garlic if you made some earlier. 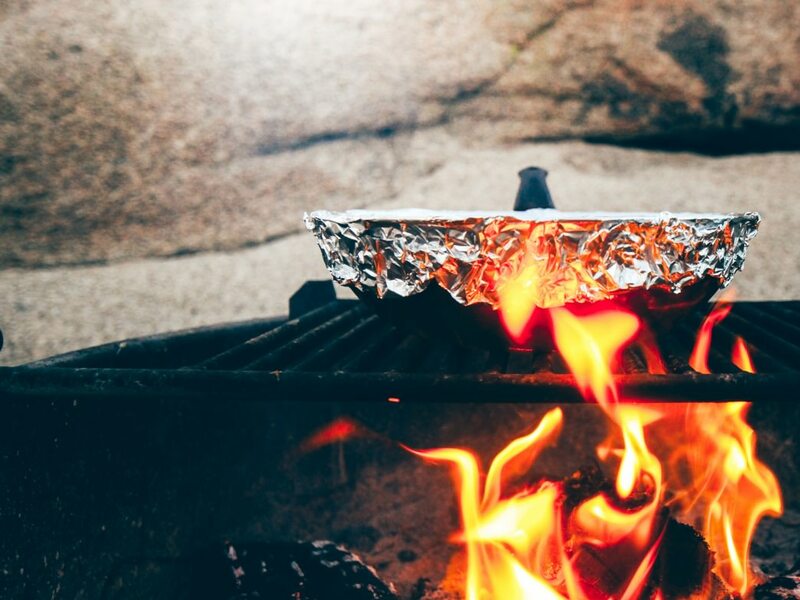 Add about ¼ cup of water, fold pocket closed and set to cook on the coals for 20-40 minutes. Bringing along some pre-cooked bacon, or honey ham to throw in with your veggies is also a great way to add a savory umami kick. The great thing about using dried chorizo here is that you don’t have to worry about refrigeration and can spend the day on the trail worry-free. 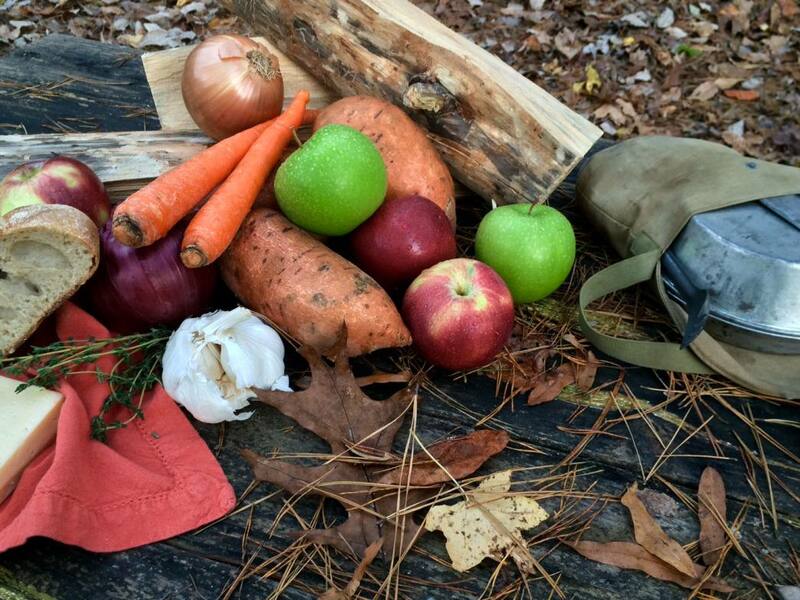 Chop all of your ingredients and wrap per the same method as the Veggie Hobo Packs. Cook over the coals for 25-35 minutes, or until potatoes are tender. If low maintenance cooking is your M.O., we’ve got you covered. Sandwiches, especially hot sandwiches with beautiful golden-buttered toast, and melted cheese oozing through the crumb (let the salivation begin) are perhaps one of the most underrated comfort foods around. And with the holidays being about comfort food, we thought we’d share some of our suggestions for making the best holiday sandwich you’ve ever had. The amounts here yield about 4 sandwiches. Assemble your sandwiches with the ingredients listed. Heat a camp skillet over the hot coals and add 1 tbl. butter to melt. Once butter is melted, toast your sandwich in the pan, grilled-cheese style. Toast your bread slices in a pan with a small amount of butter. Meanwhile, mix cream cheese with chives or rosemary (or both!). Once toasted, spread the herb cream cheese on your bread slices and go to town adding the turkey and bacon slices. It’s that easy. This dish is a mash-up of the sweet and savory holiday flavors that make a dish satisfying. 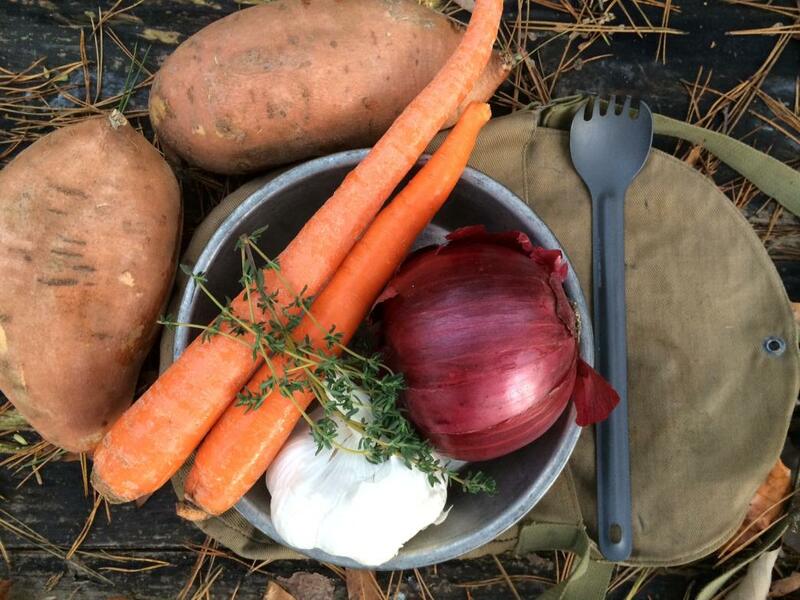 This is a one pan meal which makes it ideal for camp cooking. Coat the bottom of skillet with olive oil, cook sausage with maple syrup until browned, then remove the sausage from the skillet and set aside. Add onions and sweet potatoes to the pan and cook until sweet potatoes begin to soften, about 10 minutes. Add apples and spice mixture, cooking 8-10 minutes, or until sweet potatoes and apples are completely tender. Return the cooked sausage to the pan and toss together with a handful of dried cranberries, pecans or toasted pumpkin seeds! Is anything more reminiscent of the holidays then the aroma of baking apples and cinnamon? This perfect combination is truly a hallmark of any holiday meal, and should be included in yours too. For our rustic rendition of baked apples you will need an apple per person, aluminum foil, pairing knife and a 50/50 cinnamon-sugar mix. Leaving the skin on, cut a hole in the top and bottom of the apples to pop out the core and create a hole that cuts through the apple. Set the apple upright on a piece of foil. Sprinkle 1-2 tablespoons of cinnamon sugar mixture into the hole (which should be closed off by the foil) and wrap the foil closed around the apple. Place on the coals to cook for 10-15 minutes and enjoy a piping hot-baked apple. It’s true that most of us do not eat the same way year-round as we do around the holidays. We expect the same to be true for how we eat on the trail—usually we throw in a few packs of instant oatmeal, trail mix, some ramen and call it good. But for this special season, we hope you feel inspired to pack in a little extra weight (to keep a little extra off) and indulge in some holiday feasting and festivities chez-mother nature. Being gathered around the warmth of a fire inspires storytelling and memory sharing much the same way as being gathered around the family table.